I like Mike Pence. I wish he had run for president. But he didn’t. Donald Trump did however and, like it or not, was lawfully elected by the American people to lead the country. But as Trump’s media adversaries serve up Russian nothingburger after Russian nothingburger, his administration is finding it increasingly difficult to focus on the things it was chosen to fix, such as healthcare and tax reform. Sadly the truth, or lack thereof, behind the myriad allegations of collusion is no longer a necessary ingredient for Trump’s removal—the endless feuding between the Oval Office and the American media could sadly, over time, force a war-weary President’s resignation or convince a fatigued public that impeachment is necessary to make governing great again. Should either scenario come to pass, Mike Pence would find himself the 46th President of the United States, an eventuality preferred by some of Trump’s fellow Republicans. And the flames, though thus far imaginary, are getting warm enough to fuel rumors of the Vice President himself preparing for the possibility of a promotion; not only did he consciously distance himself from the President’s most recent Russian sideshow, but he’s also started his own PAC and recently hired a new chief of staff. While Pence is indeed a seasoned politician who is far less likely to tweet insults at entertainers in the wee hours than is his boss, his ascension to chief executive due to Trump’s resignation or impeachment would be very bad for Republicans and, by extension, very good for Democrats. The reasons are myriad and powerful, but the most obvious have enormous potential to hand 2020 to the Democrats on a solid gold platter. For starters, it may already be too late for Pence to successfully create his own identity. We are nearly two-thirds through Trump’s first year, and by the time the smoke clears from the countless legal battles that would follow from impeachment, or before Trump’s ego caved to pressure from his party to resign, the window needed for Pence to solidify himself as the leader of the free world will likely have closed. He needs to craft his own agenda and convince the American people, and the world, of his executive legitimacy, all in a matter of months. It’s a difficult enough task, especially when one considers that the Democrats will stop at nothing to ensure that Pence’s campaign is forever linked to Trump’s defunct presidency in the eyes of the American public. In fact, it may be next to impossible, even for a political heavyweight such as Pence. Even assuming Pence has time to build his brand, his connection to a fallen President will almost certainly ensure a fate similar to that of other Vice Presidents whose bosses succumbed to scandal—a fate which recent history suggests always plays poorly for the party in power. Watergate doomed Ford to the extent that he was defeated by a peanut farmer from Georgia whom many now consider the worst President in history. And there is little doubt that the 2000 Presidential election would have ended differently for Al Gore had Bill Clinton’s affair with Monica Lewinsky (and initial public denial) not dominated much of the latter’s second term. Perhaps more worrying to Republicans than history, however, is the modern reality of an unorthodox underdog who found support in Democratic strongholds ceding power to a career conservative archetype. It was a combination of Trump’s hard lines on immigration and terror, his more left-wing views on trade and economics, and his politically incorrect persona that slayed the Clinton Goliath. Trump’s agenda was never fully in line with the GOP’s, a trait which likely won him the election. Pence’s more reasoned, calculated approach, and his more traditional stances on issues such as trade and gay marriage, are far more in line with the ideals of the Republican establishment. And there is zero reason to believe they will play well in the regions that voted for Obama not five years ago, yet went for Trump in November. Let’s be honest: if Trump resigns or is successfully impeached, a Pence administration beyond the next Presidential election is far-fetched. That’s bad enough for Republicans, but it’s peanuts compared to the ghost of Richard Nixon. The last Republican president to be mired in scandal is now a cliché metric against which all corruption, real or imagined, is measured. The term “Watergate” is tossed around so casually these days, particularly in reference to the unproven pseudoscandals thrown at Trump, that it has become an all-but-meaningless term. 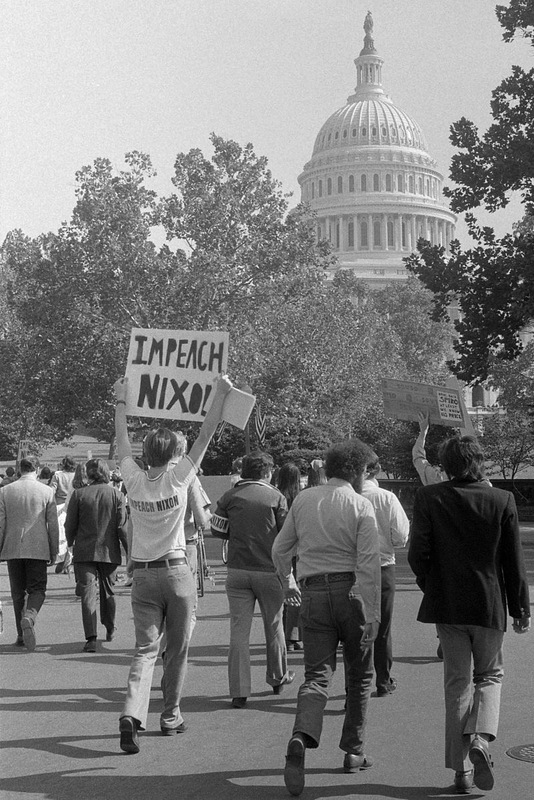 Nixon’s crimes were real, and they almost certainly did long-lasting damage to the Republican brand, particularly among young voters of the time. Trump’s crimes may well be little more than leftist sore losering, but the Republican Party can ill afford to be defined once again by a deposed President. Perhaps the most difficult pill to swallow should Pence prematurely take the reins, however, would be the mainstream media’s “victory.” Despite batting close to zero when it comes to reporting on the Trump presidency, an early Trump departure would be touted by the disingenuous fourth estate as proof that they were right all along, and that the end justified the means. There is little doubt that Pence would make a competent, perhaps even great, President. But to truly be effective he needs to achieve that title on his own terms, and that means waiting at least three and a half years. Despite the current circus-like atmosphere, Republicans would be wise to go to the mat for Trump, who as of yet is innocent of any wrongdoing. It’s both the morally right and politically savvy thing to do. In fact, the future of the party may well depend on it. Another insightful article. I don’t believe trump would ever resign. Period. There are to date no grounds for impeachment as well.